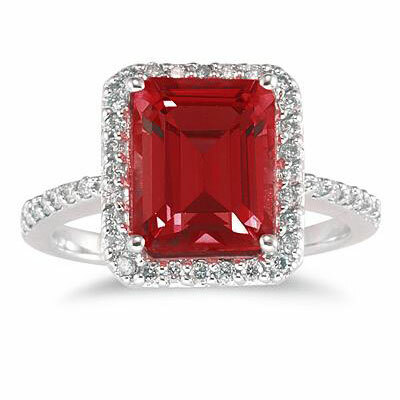 This Emerald-Cut Garnet Diamond Cocktail Ring in 14K White Gold provides glamour in an instant as it gorgeously displays a stunning red semiprecious gemstone is a timeless and sophisticated style, complementing it with the versatile dazzle of diamonds. The primary source of this cocktail ring's glamour is a striking garnet, a richly-hued semiprecious gemstone measuring a full centimeter high and 8mm wide. 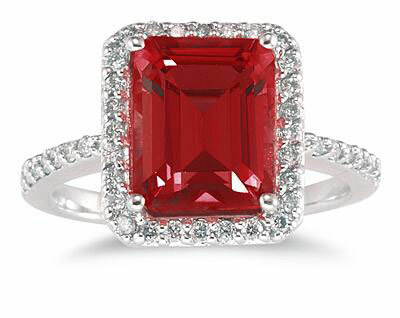 Weighing in at 4.50 carats, this eye-catching stone has a rich crimson hue that's made it a sought-after pick for thousands of years. 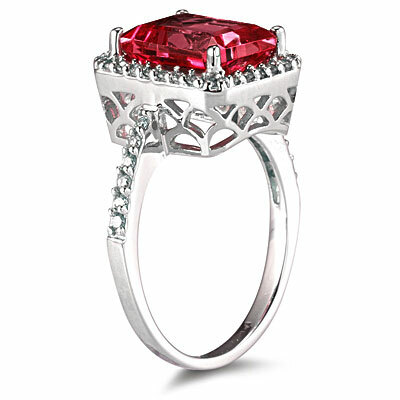 Contrasting the center garnet are 0.29 carats of small round diamonds, a number of which form a glittering frame around this crimson gem, providing stunning contrast with the garnet and making this design a sophisticated take on the classic halo ring. Although the halo ring first came into vogue in the 1920s and has peaked in popularity several times since then, this design never falls out of fashion, and this garnet and diamond version is evidence of its perpetual appeal and trend-surpassing glamour. Set on a diamond-studded band of 14K white gold, this is an eye-catching ring that you'll slip on whenever you want to take your look up by more than just a notch. We guarantee our Emerald-Cut Garnet Diamond Cocktail Ring, 14K White Gold to be high quality, authentic jewelry, as described above.